The Apostle John wrote his first letter to help believers measure the quality of their belief—to know if their faith was genuine. He gives numerous “benchmarks” that show whether one truly knows God and possesses eternal life. It is apparently important we know for sure that when we claim to know God, we have something upon which to base that claim. The word “know” occurs 27 times in 22 verses in the First Epistle of John in the King James Version (KJV), and 35 times in 29 verses in the New Living Translation (NLT). There are only 105 verses in this letter from the Apostle of Love. Let’s look first at the things the Lord wants us to “know” as found in John’s letter from the NLT. Each of the items listed comes with an explanation of proof so that we can examine the evidence to see if we truly know what we claim. On a secondary level, we can also know whether someone who claims to “know” speaks truly, based on the same evidence. His entire letter, and especially this verse, speaks to what is known as the Doctrine of Assurance (assurance of salvation). Assurance of salvation is something the Holy Spirit wants us to have as evidenced by this letter of John. 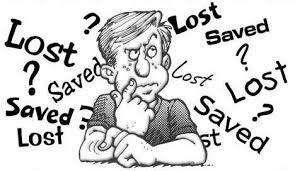 Doubts as to whether one is truly saved can, and often does, plague the sincere believer. Doubt without an answer can lead to a host of problems, not the least of which is a floating conviction without any substance. This type of “conviction” can never be remedied by any amount of confession of sin, because it is a lie from the pit of hell. Doubt can only be answered by faith, and that faith must be based on something genuine. 1. Assurance comes from faith in the promises of God. 2. Assurance comes from the testimony of the Holy Spirit testifying to our spirits that we are children of God. 3. Assurance comes from “a serious and holy pursuit of a clear conscience and of good works” (5.10). In other words, believers find assurance in the promises of God, the witness of the Spirit, and evidences of Christ’s grace in our lives. Any one of these by itself may provide a measure of assurance; but when all three come together, assurance becomes a fixed point upon which to base your faith. If we are to “examine ourselves to see if we are in the faith” (2 Cor. 13:5), then it will help us to have a standard by which to make that examination. We can do no better than to use what God has revealed to us in His Word through this letter of John. We will begin to look at each of these next time.